About.com's Quilting forum is headed up by the guide, Susan Druding. Susan is lovely person and recently experienced the unexpected death of a very dear friend of long standing. 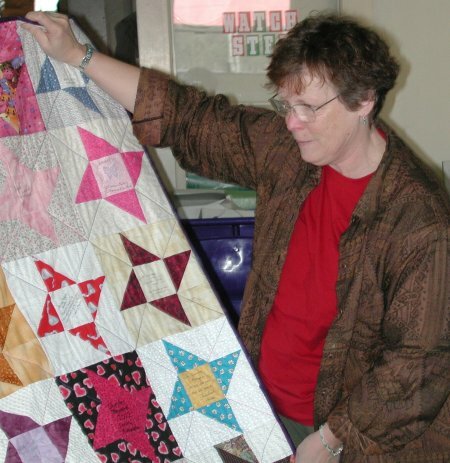 To show our support and friendship for Susan, a large number of About.com's quilting forum members surriptiously decided to make Friendship Star blocks and assemble them into a comfort quilt for Susan. After all the individual blocks were assembled into a top, it was quilted and hand-delivered by myself and Christine Thresh to Susan at her yarn warehouse business in Richmond, CA. To say she was surprised is an understatement! 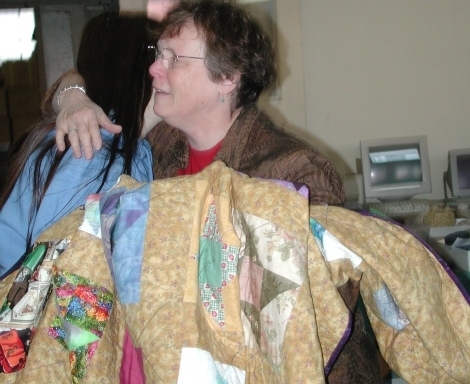 She was very, very touched by the quilt.